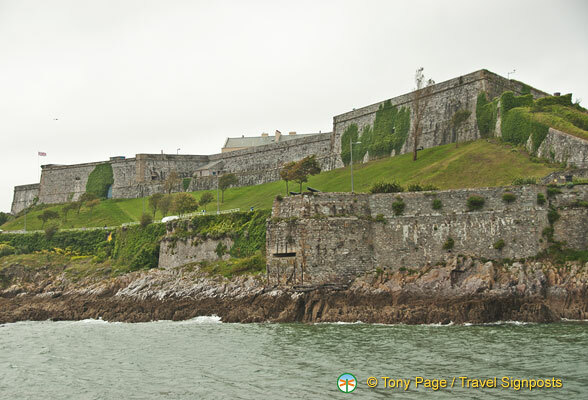 On our Plymouth Harbour cruise we caught sight of the impenetrable walls of the Royal Citadel. Even from the water, the 70-ft high walls of the Royal Citadel look dramatic and dominate the eastern side of the Hoe. Its size hints at the role that Plymouth played in England’s naval history. The Royal Citadel occupies a site where the Plymouth Fort previously stood. After the threatened invasion by the Spanish Armada, Sir Francis Drake requested the construction of the Fort. It was King Charles II who ordered that the Royal Citadel be built in 1665, as a defense against a threatened Dutch invasion. The King believed that the safety of the Navy was paramount to protect Plymouth’s military and commercial harbour. The Royal Citadel remained a most important English defence for over 100 years. But in building the Citadel, King Charles II also had own interests in mind. The fortress also served to intimidate rebellious locals who were staunch supporters of Cromwell and the Parliamentarian cause during the Civil War. And, with some of the citadel guns trained on the town rather than out to sea, the locals had reason to feel intimidated. Over the years, the Citadel was regularly strengthened and during the 1750’s it was equipped with as many as 113 guns. It is still in use today by the British military. The Royal Citadel is now an English Heritage property and you can only visit the site on tours by the Blue Badge Guides. On these guided tour visitors are taken for a walk along the ramparts from where there are stunning views out to Plymouth Sound and the old town. You’ll also be shown some of the weaponry in the fortress, with the guides imparting information about the history of the Royal Citadel, its occupants and British military history. The tours run from May to September (these periods do change) and are available on Tuesdays and Thursdays only at 2:30 p.m. It is necessary to book your tour prior to visiting. You can email them at plymouth.citadel.tours@googlemail.com. Helen Page is a prolific blogger and ardent traveller; she runs Travelsignposts with her professional writer and photographer husband Tony. Sign up now to get emailed news as well as other site updates! We're Helen and Tony Page, and we love travelling - lucky as we've been doing it for the last few decades! Tony has long been a professional photographer and writer, but Helen now writes most of the posts and takes a lot of photos herself! Travelsignposts is our main travel planning site, but we've just launched Travelsignposts China and Tony also runs the Travelsignposts Photo and Guerrilla Travel Photography web sites, as well as publishing the Take Better Digital Photos and Guerrilla Travel Photography eBooks. Read more about Helen and Tony or contact them. Get a free PDF of this post! Just enter your email address below and we'll send it to you immediately.